"Whisker Type" probes specially designed for measurement of samples with near vertical sidewalls. CSC05_20°/5 - "Whisker Type" probes for contact modes with inclination angle 20 degrees. NT-MDT Spectrum Instruments offers a special probe, designed for studying deep holes, trenches and narrow gaps. 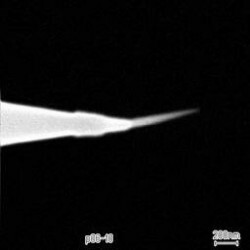 It differs from any standard probe by having at the very end a long and slim "whisker". CSC05_20° - for contact mode.